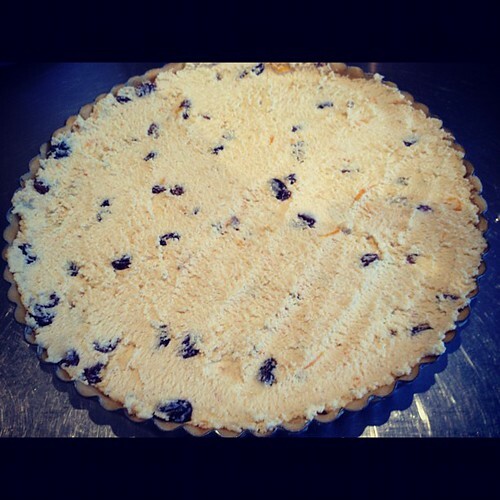 Here is the second part of the Italian night meal – Ricotta and Sultana Tart. 1. Put the sultanas in a small saucepan, pour in the Marsala and cook over a low heat for 10 minutes. 2. Sift the flour into a mound, make a well in the centre, add the butter, 50g of the sugar, one of the egg yolks and half the lemon rind and mix well. 3. Shape the dough into a ball, wrap and leave to stand for1 hour. 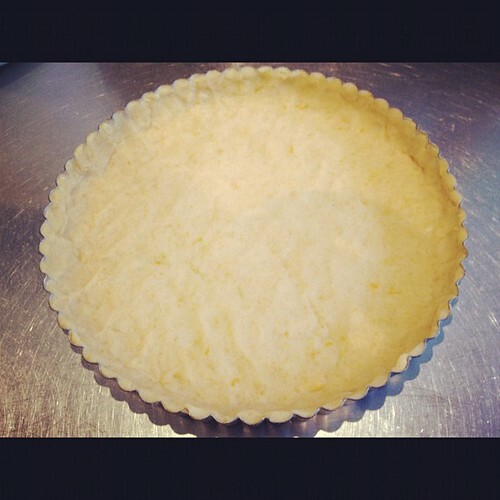 Preheat oven to 180 degrees celcius, grease and dust a 22.5cm tart tin. 4. 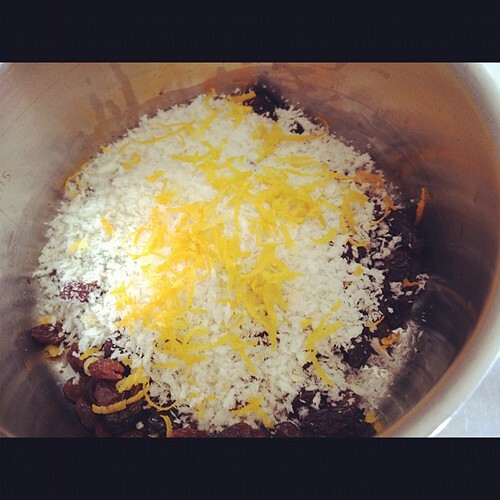 Drain the sultanas and squeeze out. Beat the remaining egg yolk with the remaining sugar in a bowl until pale and fluffy, then add the ricotta, breadcrumbs, sultanas and remaining lemon rind. 5. Halve the pastry and roll out one piece on a lightly floured surface to 5mm thick round. Line the tin. 6. Sprinkle the ricotta mixture on top. Bake for 45 minutes, remove from the oven and cool. 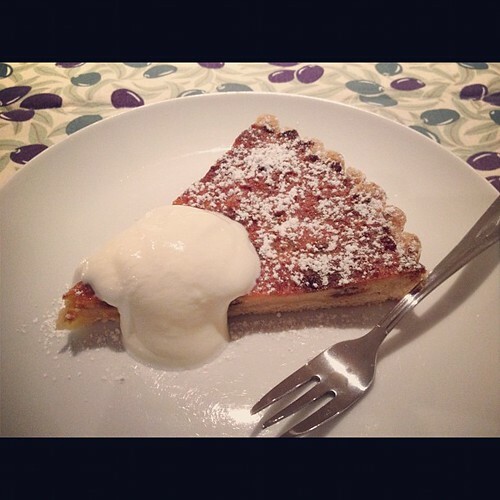 I dusted with icing sugar and served the tart with honey greek yoghurt. I was a bit disappointed with this to be honest – the recipe has sultanas soaked in Marsala wine, so I had visions of juicy, plump, Marsala infused sultanas, but I found the taste didn’t quite come through. Still it was pretty easy to make, and lighter than a heavy cheesecake. I’d make it again, maybe as a summertime tart and add lots of strawberries as an accompaniment. Recipe from “The Silver Spoon” which is the Italian cooking bible – over 2000 recipes and more than 1 million copies sold worldwide. Highly recommended if you’re into Italian food!